Teicher talked about independent bookstores with Lenny Mendonca, owner of Half Moon Bay Brewing Company and director of California’s Office of Business and Economic Development. 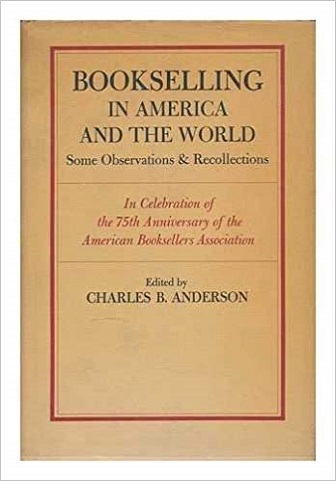 This chapter discusses ABA’s operations during World War I and its move to a full-time staff, among other topics. Here, ABA’s CEO reflects on exciting events on the horizon for ABA member booksellers in the coming months, including the 2019 Spring Forums, BookExpo, and the seventh annual Children’s Institute. The event was “part of our ongoing effort to make sure that all constituents have a better understanding of what it is to be an indie bookseller,” said ABA Senior Program Officer Joy Dallanegra-Sanger. More than 200 booksellers applied for the 2019 scholarships over just two weeks, representing 145 bookstores in 39 states and the District of Columbia. The session at Winter Institute 14 examined why author James Baldwin’s work has, does, and will always matter and explored how to grow his audience through independent bookstores. The program connects U.S. booksellers to the international book community through all-expenses-paid trips to the world’s premier book fairs. Dr. Robert DelCampo will discuss the challenges of recruitment and retention as well as creating a workforce that represents multiple generations of employees. Booksellers can sign up for sessions on developing leaders, staff management and human resources, and in-store merchandising, as well as a used bookstore forum. American booksellers Dylan Brown of Skylight Books, Lyn Roberts of Square Books, and Adam Sonderberg of Seminary Co-op reflect on this year’s Frankfurt Book Fair. Deutsch was one of several ABA member booksellers who attended the fair, including three who received the 2018 Bookselling Without Borders scholarship from Europa Editions. Booksellers at last week’s virtual marketing roundtable discussed how they have implemented subscription services in their stores. During ABA’s most recent virtual roundtable discussion, booksellers talked about creative new ways to engage with their customers, including through text messaging. A new event hosted by the Southern Independent Booksellers Alliance featured creative talks by booksellers, authors, and industry professionals on topics from social media to branding to goal-setting.